Direct mail is performing better than ever! More businesses are turning to direct mail postcards to grow their sales. But, all postcards are not created equal. A few tweaks can turn a mediocre card into a sales gold mine. For the past 15 years, we’ve seen thousands of super successful, and some not-so-successful direct mail campaigns. We’ve learned what works for movers and what doesn’t. When used properly, postcards are a powerful marketing tool to connect you with your best potential customer. And when you combine all of the proper elements, they will bring in business. Need more convincing that direct mail produces quality leads? Check out 5 Reasons Direct Mail Works for the Moving Industry. If you want to turn more leads into sales (who doesn't? ), here’s a simple postcard recipe for you to follow. Check out our most effective design tips below to achieve the best results with your next direct mail campaign. An image can say a thousand words—make sure you're telling the right story with yours. You only have a few seconds to capture a reader’s attention. Can homeowners understand what you're offering at a glance? Test your postcard design, if you remove the text, can you still understand the message? If not, consider a new image. Always make sure your photo is high-resolution (300 DPI). Web images are typically lower resolution and will print blurry. **INSIGHT: Put a truck on it. 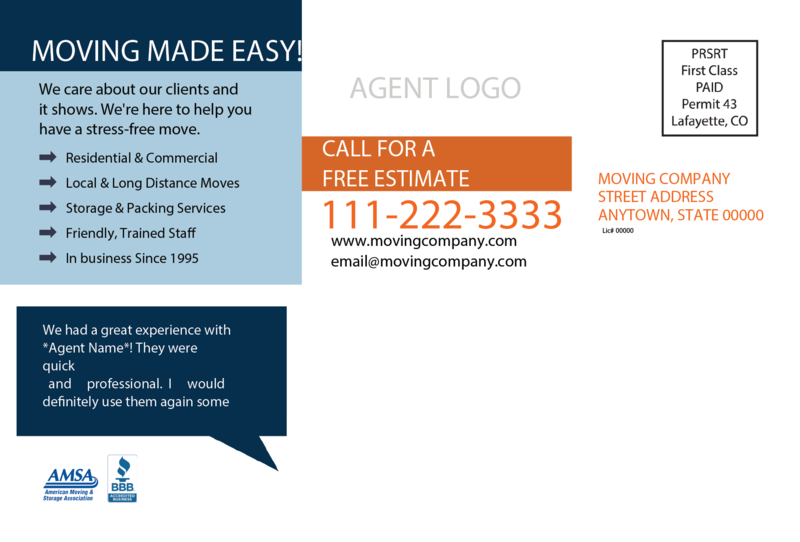 We’ve found postcards with a moving truck image or "movers in action" nearly always outperform other postcards. Good design is a BIG help in today's media savvy world. Let's be honest, if you don't like looking at your card, no one else will. We recommend hiring a professional designer—you can use this guide to find one. We offer design specifications to help get your designer started. Bright colors can be a real asset to draw the eye. However, they can also backfire. If it's a horrible combination of colors, or bright enough to give you a headache...nobody will want to give it a second glance (or a first). *EXAMPLE: Notice the vibrant blue color, catchy headline, this moving service story told with several pictures, and minimal text. It's professional, inviting and clear. You can't know which side of the card a homeowner will look at first. It's a 50/50 shot. Both sides of your card need a strong headline that will catch their attention and compel them to keep reading. Your headers should work together and reinforce a key message. Does that headline "pop"? You should see it first when you glance at the card. If you don't, try another color, increase the font size, or use another font style to draw the eye. A cluttered postcard is an unread one. The most important message you need to convey is said through visuals, your offer, and contact information. When adding copy, keep your message clear, concise, and short. If there are large blocks of copy, the reader will not know what is most important and your message will be lost. More than ever people are scanning documents and ads. Make it easier for them to understand and you'll reap higher interest and sales. Your supporting text should be clear, direct, and short. The front of the card should be driven by imagery and minimal text. On the back of a postcard, a good rule of thumb is less than 60 words—and I strongly recommend keeping your copy under 100 words! Bullet points are your friend. They'll force you to highlight key points, help break-up the text, and group things so it's easier for readers to quickly digest key info. Along with features (like “In-state and interstate moves” or “long-term and short-term storage”), you want to help people see why they should use you instead of another provider. 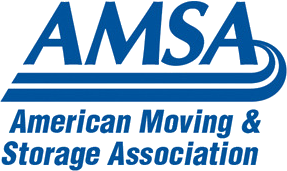 Professionalism - 72% of homeowners want proof that their moving company comprised of moving professionals. You can do this by mentioning licensing, insurance, and professional organization memberships. Value - 48% of homeowners were interested in getting a great value which you can offer with free in-home estimates. See tip #7 for more details on how you can add value. Reputation - Most homeowners want to know about your reputation. 63% of homeowners want to see favorable online rankings and 50% want to see customer testimonials.You can also illustrate reputation with the number of years you’ve been in service and any awards that you’ve won. 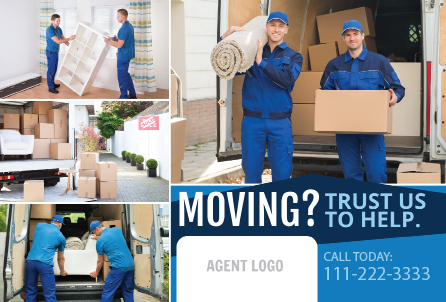 Including these in your postcard can help spell out the benefits for them: “Award-winning service you can trust—Family owned for 30 years," or "Highly trained and licensed movers for a stress-free move” or “We care about our clients and it shows in 15 years of happy moves.” You get the idea. *EXAMPLE: There's a simple headline, benefits, features list, a testimonial, and call to action with a special offer. It's clutter free & clear! Your website and phone number should appear on both sides in large, easy-to-read type. Occasionally I see a moving postcard without a return address. I strongly recommend including yours. Here's why: It builds trust by reassuring homeowners that you are a legitimate business with a physical address. 7. SPECIAL OFFER - Make an offer they can’t resist! Never underestimate the value of a deal—even a small one. Can you offer something to encourage people to call right away? Homeowners are looking for value and a deal might be all it takes to tip the scales in your favor. *We often suggest using a free estimate as an initial offer. Free estimates give homeowners an immediate value that isn’t dependent on them making a purchase. If you are offering a discount, make sure you are abiding by state laws on what can be offered to the homeowner. It may seem silly, but asking for what you want works. Studies show that having a clear call-to-action will get more responses. Ideally, you want your phone to ring. Encourage homeowners to call and make that call-to-action impossible to miss; bigger font, brighter color, design or box around offer, etc. The bottom 3/4” of the postcard is used by the USPS for barcoding and electronic scanning. Telephone numbers, websites, or text in these areas will be labeled-over by the post office and cause the mail to be returned. 9 steps to get your phone ringing. Follow these tips and you'll have smarter and sleeker postcards that are bound to improve your bottom line!